While it’s possible to do monitoring with tools like RPI-Monitor on headless or remote systems, top and htop are likely the commonly used tools to monitor CPU and process usage in the terminal. There’s now a new and different option with the Stress Terminal UI that display pretty charts for frequency, CPU usage, and temperature in the terminal, and as its name implies it can also stress the system. It took the screenshot above after enabling stress operation for a few seconds, and while frequency and CPU utilization in percent are updated properly, temperature is not, at least on my system. I had to enable “Smooth Graph” option to see any changes in the first two charts. I tried to run the app again with sudo, but still no temperature update, and that’s because the program is confused since I have two “temp1” values in my machine, one for “it8720” that will always show a constant temperature (45 °C) and one for “AMD CPU” that will vary depending on the load. * Toggle between stressed and regular operation using the radio buttons. 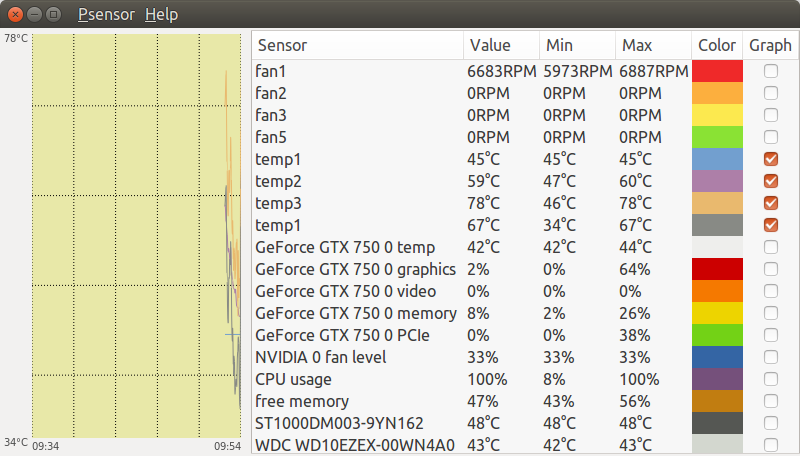 I could install it and run it, but only CPU and temperature charts would be drawn. modprobe: FATAL: Module msr not found. So overall, it’s still work in progress. Support for showing info for multiple cores would be nice, but probably only suitable in a full screen terminal. But temperatures were reported correctly. Also the tool is lightweight enough to not change system behaviour (that’s a huge problem with most usual monitoring solutions when running on embedded devices: the daemons collecting data being too aggressive and by starting to monitor the whole system behaviour changes… eg. CPU cores now running constantly at the upper clockspeed). root@lime2:~# find /sys -name "temp*"
In case you want to support a couple of dev boards properly please be aware that thermal readouts also depend on kernel version (for many SBC more than one kernel variant exists, eg. the very popular Orange Pi can run a smelly 3.4 kernel but also latest and greatest mainline — sysfs node to readout temperature is the same with both kernels but with legacy you get degrees and with mainline kernel millidegrees instead). In Armbian wrt CPU/SoC temperature it’s basically this to get the proper SoC temperature sysfs node and that to interpret the value properly (tested on +50 SBC with up to 3 kernel variants per board). Thanks for the update, I could use custom temperature as follows. I can see you have a new option for power, but it does not work on my machine (desktop PC), it just shows N/A. In the list of sensors I have “power1”. The power read is currently only available on >= Intel 2nd Gen CPUs. If there is a way to get the this data for AMD/ARM systems, we would like to hear suggestions/receive pull requests. I believe the power sensor that shows up is of your graphics card and not of the CPU. Looks promising. The only problem now is to get access to an AMD system.